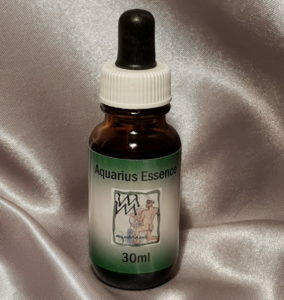 Aquarius Essence is the eleventh in the Sun Sign range. The eleventh sign of the Zodiac Aquarius The Water Bearer (21st January – 19th February). The ripples of the Aquarius glyph symbolises the coming together of intuition and reason of humanitariansism. Aquarius is the sign of individual freedom, social and humanitarian solidarity, co-operation and original ideas. Aquarians sometimes rebel against discipline and can be unreliable and eccentric. Karma for Aquarius pertains to previous rebellion and conflicts with authority. The karmic challenge is to keep the best from the past, letting go of the rest and evolving flexibly. The standard Essence dose of 7 drops from the dosage bottle, under the tongue, first thing in the morning and last thing at night. These times of the day are powerful periods for the psyche, and at the same time they make it very easy for you to remember to take them or give them to your children or animals. Are they safe and can anyone use them? These Essences are completely natural. They are perfectly safe, free from side effects and adjust to the needs of the individual taking them. It is not possible to overdose on them. These Essences can be used by adults, pregnant women, children and animals. Star Sign Essences are very hardy: however there are some precautions that should be taken to keep them at their best. · Never store Essences near electronic equipment ie mobile phones, computers, microwave ovens, clock radios and televisions. · Don’t store in full sun for long periods or in other places where they will get excessively hot, such as the boot of a car. Occasional exposure to such conditions will not harm the Essences but long term it could reduce their efficiency. · Always close the bottle immediately after use and don’t allow the dropper to touch the mouth or other parts of the body as that could contaminate the Essences when it is returned to the bottle.